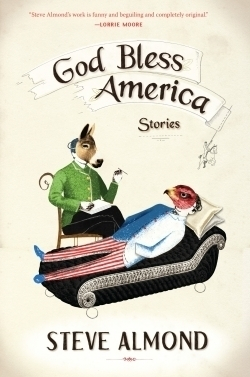 God bless America: a cliché that seems to be all around us. We hear it said in earnest and with sarcasm. And as such, it sets the right tone for Steve Almond’s third short story collection, which finds room for both the heartfelt and the ironic. Almond graciously bestows his wit onto his characters even as they grapple with the serious. Equal parts comedy and profundity, Almond’s stories are the kind one sits back and revels in. In this heartrending book, a TSA agent finds cause for regret in the face of a precocious and mouthy child (who knows how to profit from the airline ticket system). And in “Donkey Greedy, Donkey Gets Punched”—which earned a place in *Best American Short Stories—*a gambling-addicted psychoanalyst finds that he needs something from his client as the doctor-patient grows more complicated. We literally see the cards the doctor is dealt—and he, like the other characters in this book, isn’t always among the lucky ones. Almond bears witness to such uncanny but recognizable lives among us in this masterful collection.